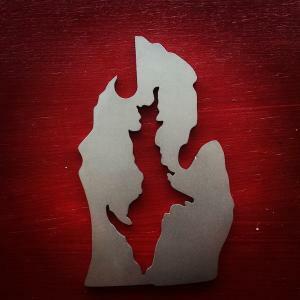 Just when you thought both peninsulas couldn't exist in one wallet, we found a way to unite Yoopers and Mitten folks alike. As much as we'd like to take credit for how good this opener looks, we copied the great lakes curve for curve. Every opener comes tucked in a hand-stamped, recycled paper credit card sleeve. Made of 100% stainless steel and manufactured right here in Michigan. 2.12"x3.37"